Both IBM and McAfee made headlines recently when they announced acquisitions in the Security Information and Event Management (SIEM) space. IBM’s intention to acquire Q1-Labs and McAfee’s planned acquisition of NitroSecurity reinforce the fact that SIEM solutions are now “must-have” technologies for organisations seeking to mitigate the risk from cyber threat and cyber crime. Join us to understand what this market consolidation means to you and how these and other recent events serve to validate HP's Security Intelligence and Risk Management Strategy. 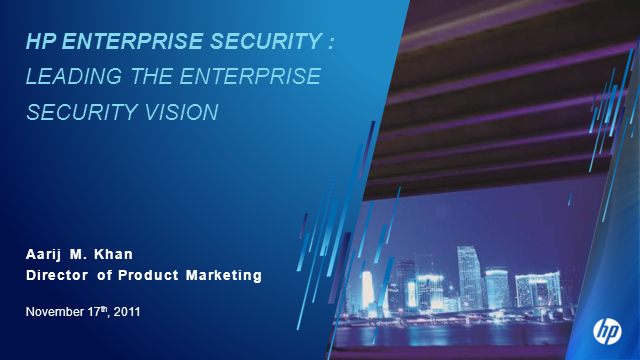 This webinar will also look at the HP ArcSight SIEM Platform, as well as other HP Enterprise Security Products, and will present specific factors to consider when evaluating different SIEM and enterprise security products.